10) Shortly after this photo was taken, two swamp rats jumped from Falcone's beard. 9) That's a Cub Scout staring at the nearly naked guy in the back. 8) Falcone's teammates forced him to wear jerseys with the word "FEET" on the back — as evidenced by the jerseys draped across that stool — to draw attention to his noxious loafers. 7) The look inside the locker exposes Falcone as a poncho enthusiast. 6) At the time of this photo, Falcone was chewing the wax from the wax pack, not the gum. 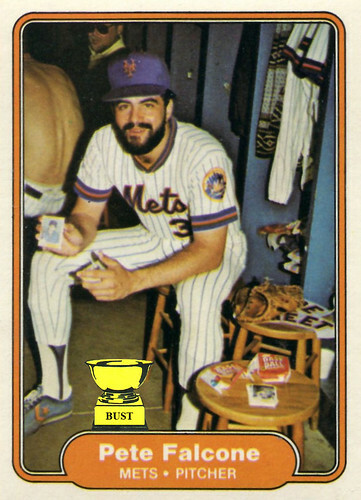 5) This was a shot of Mr. Met's Irish Bar, housed in the Mets' locker room from 1977 to 1983. 4) Falcone fought Fleer to have his name appear as "Pete Falcon." 3) It's the only card ever to feature the horrifying, bony back of Zelda from "Pet Sematary." 2) Truman Capote wrote a chapter of "In Cold Blood" while hiding out in the back of this card. 1) Falcone is actually holding a Pete Falcone card that's more worthless than this one.